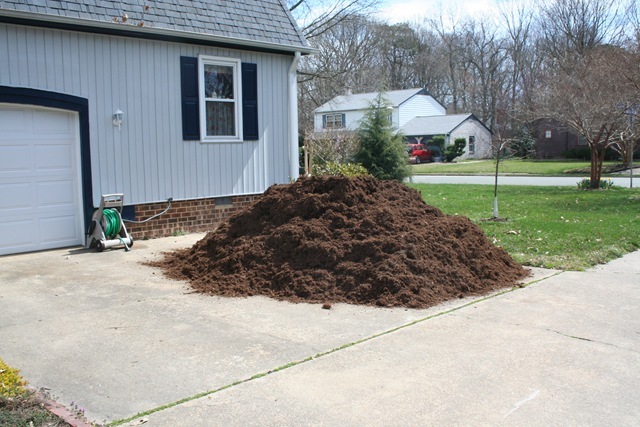 You know that mulch is sold by the cubic yard, but when it comes time to order it don't you always wonder "now exactly how much does a yard look like?" "How many yards will I need?" Here is my pile of 8 yards of mulch that was delivered today. 8 yards is a big pile. Last year we ordered 10 yds so spreading 8 yds this year should be a piece of cake. right? Will it make you feel better if I say that the mulch looks so light and fluffy from over here..shouldn’t be too hard to spread? giggle…your garden will be thanking you for all that pretty mulch. Piece of cake. Hope your muscles aren’t too sore….it will look great when it is done tho. Happy Spring! Don’t complain! We are having a blizzard (quote from the weather man) with as much as a foot (that’s right–12″) of snow this weekend! 3 to 4 foot drifts! But Bev, you say, you live in Oklahoma City! That’s right. In the last week we’ve had earthquakes (10 in one day), tornados and now, a blizzard. Okay, so we are mainly conservatives but hey–what else did we do? oh yes.we had that much delivered a year or so ago. It took an entire weekend to spread. My shoulders ache looking at your photo. Good luck! I know. When I ordered sand, I had no idea how much “a yard” meant. Now I’m getting the hang of it though! That has happened to us more than once! The mulch, the topsoil, and the firewood. Nothing makes me crazier than coming home and finding it dumped at the very end of our driveway though. We finally got smart last year and put two huge tarps on the driveway before they dumped…the mulch was so much easier to use this way. We separated the two, front yard and back and dragged the mulch closer to the gardens. Looks like your gardening will be in full swing now…we are only just getting started. Have a wonderful weekend. Heck no! Just 8 yards is easy peasy! LOL!!! My back hurts looking at it! Looks like you have some work ahead of you! Hope your weather is good this weekend. Just think of all the calories you will burn and muscles you will build!